Since Red Bull gives you wings, maybe he’s hoping that flying will give him a heads up over the roadrunner. 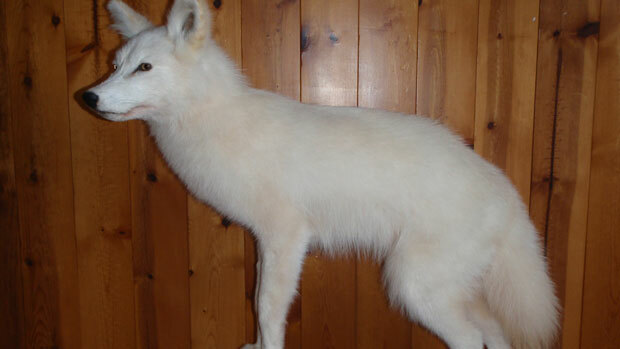 A taxidermy of a white coyote from Newfoundland. A recent genetic study of white coyotes in Newfoundland has revealed that their whiteness is actually the cream gene that entered the coyote gene pool from a tryst between a coyote and a cream-colored golden retriever in 2001. Science researcher Carl Zimmer has written an article on the white coyotes in the current issue of the magazine. Zimmer said he became interested in writing about the white coyote after he stumbled across a research paper in the January 2013 edition of the journal Mammalian Genome written by researchers at Memorial University and wildlife officials at Newfoundland and Labrador’s Department of Environment and Conservation. Zimmer said the scientific paper described the DNA of six white coyotes — turned in by hunters to wildlife officials — and an interesting theory on the origin of the genetic mutation. “This raises, I think, a very plausible possibility that the coyotes in Newfoundland got this gene from a golden retriever,” said Zimmer. Zimmer pointed out that there were reports in Newfoundland that a coyote had run off with a golden retriever dog in 2001. Now if you listen to the audio interview on the site, the sequence of the gene is exactly the same as a golden retriever, and there was a golden retriever that was seen running around that area from 2001 to 2003 during coyote mating season. This is the second time that a dog color has been confirmed to have been introduced into a wild canid through hybridization. Black color in North American and Italian wolves and the black color in coyotes has been confirmed to have originated through crossing with black domestic dogs. This is, however, the first time it has been traced to single dog breed and to a single individual. Marshall and her colleagues speculate that their snowy coyotes may also be the product of both genetic drift and natural selection. If a golden retriever did indeed consort with a coyote in 2001, it did so at a time when there were still very few coyotes on Newfoundland. That would have meant that from the start, coyotes with the Mc1r variant made up a relatively large percentage of the coyote population. When the population exploded, the white variant might have exploded too. Nevertheless, the pattern of mutations in the white-fur gene hint that natural selection has been acting on the white coyotes as well. It doesn’t say what color the golden retriever was, but my guess is it had to have been a pale golden one. There are a lot of golden retrievers that are this very color.